Stowa is a new version of the model Antea. 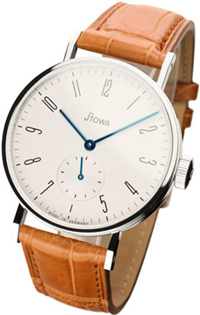 German watchmaker Stowa has developed and released a new model Antea. German watchmaker Stowa has developed and released a new model Antea. Most recently, Mark has presented on the watch market the same model with a black dial. New Antea, made in a classic style, presented in bright colors. It is made in a vintage style with light and graceful elements. Nothing superfluous in the design model is not, not a single additional component. The model is presented in a round housing with a diameter 35.5 mm and a thickness of 6.8 mm in polished stainless steel. Compared with the previous hours of the line, the new model white dial, equipped with black Arabic numerals, two central arrows to indicate the hours and minutes. Small second hand is in the position of 6 o’clock. The numeral 12 o’clock is the logo of the brand. Protects dial sapphire crystal. The back of the model Antea also closed sapphire crystal, you can monitor the operation of the mechanism Peseux 7001 manual winding. Caliber, decorated in the style of Côte de Geneve and Geneva Stripes, equipped with 44 hour power reserve, as well as the functions of hours, minutes and seconds. The novelty comes on a leather strap with stainless steel rust-colored buckle.